Last of the Mohicans was released in theaters about 10 years ago, and I remember rather liking the film. 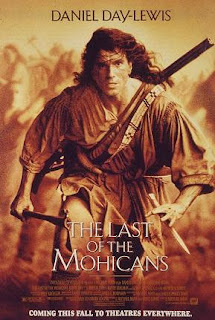 The 1992 film was a remake of the 1936 movie, which is of course based on the 1826 novel by James Fenimore Cooper. The story is set in the North American theater of the Seven Years War, which we in the US know as the French-Indian War. I doubt that there was much merchandising surrounding this film, and I don't think that any figures representing the characters have been created in metal, so I was rather surprised recently to find that BUM has produced a set of 1/72 figures titled "Film Characters Last Mohican" (BUM 2010) depicting the characters in this film. The first image is of the various characters in the film, made in a soft rubbery resin. From left to right they are: Chingachgook, Uncas, Alice, Duncan (? ), Cora, Hawkeye, and Magua choking the life from Colonel Munro. Hawkeye is a bit wide, but I have to say that the sculpting for BUM figures has come a long way since the days of their knockoffs of old figures from other companies. There is also a diorama-style piece of Major Heyward pinned under a rather undersized horse in resin. And a vacuform terrain piece. The set also comes with a set of Huron warriors that are also made in the same type of resin. These same poses also come in plastic, which was what I was hoping for in this set, but from what I see at PSR, maybe these resin figures hold detail better than their plastic counterparts. I keep wanting to give BUM a chance since they produce subjects neglected by most other companies, but I am always left with mixed feelings about their figures. High price tag aside, why do they keep using the crappy rubbery resin that they do? These figures do not have the brittleness of some of the earlier releases, but after trimming the sprues from the bases, the remains reminded me of nothing so much as rubber pencil erasers. I just don't understand why BUM cannot find a better resin than what they are using given the cost of their figures. I'm sure there are plenty of resins that hold detail just as well as the current stuff, and much more suitable for making figures. The rubbery material they are using makes me uneasy, and I get the feeling I should seal the figures as soon as possible or they may dry up and crack like old windshield wiper blades. If people are interested in this film, the current US DVD release is not the theatrical version, but a recut director's version. From what I understand, the region 2 UK version is the only theatrical version available.